Up conversion from 480i: As difficult and unpredictable as the BD80U is with calibration, the same applies to the picture experience. At times the LC-46BD80U had ultra saturated looking blacks and great contrast. At others the picture appeared washed out during dark scenes. There is a lot of processing going on with this TV at many different levels. The internal picture doctor is hard at work. Therefore we viewed a lot of source material on it to try to get a clear understanding of the strengths and weaknesses. There are motion artifacts of varieties – swimmy effects with side to side jerky motion. At times there is flicker and background noise. In other scenes the presentation looked fantastic, clear, vivid and colorful. The 3D-Y/C feature is available for analog signals and is intended to minimize dot crawl and cross color noise. 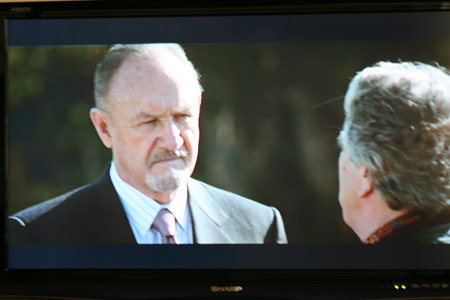 John Cusak converses with another juror in this scene from the 480i DVD of Runaway Jury. The shot shows the BD80Us good contrast. 720p/1080i/1080p Picture Quality: Since there is a lot of processing going on with the internal video chip sets we recommend turning the Sharpness control all the way down to nil. As well, tune the Digital Noise Reduction feature to the Low setting. Except for fast motion sports programming turn the Fine Motion Enhanced (120 Hz feature) to the Off position. We did not note any of the kitchy, card board cutout effects from this feature as with many 120hz TVs. The feature does however introduce some depth reduction. Then lastly, the OPC (optimum picture control) feature effectively increases and decreases contrast and brightness (through backlight manipulation) presentation based on the content and your room viewing conditions. In a brightly lit room I would leave this feature turned On. Otherwise, turn it off to eliminate as much processing noise as possible. The HD picture from the BD80U was clean and sharp with saturated color. Motion artifacts and side to side jerkiness were still visible with an HD signal. 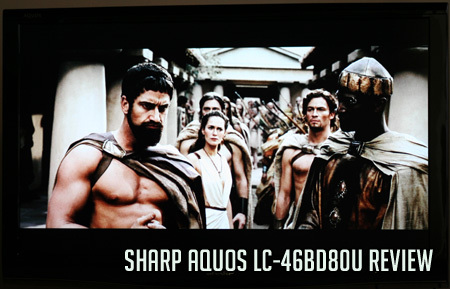 This shot from 300 shows good brightness, contrast and detail from the Blu Ray HD signal. Blacks can get oversaturated. Black Level/Contrast/Contrast Ratio: Overall ANSI post calibration contrast measured a respectable 839:1. The black levels from front and center appeared deep and saturated and the TV seemed plenty bright. Dark Shadow Detail: Though black levels are saturated we feel shadow detail is weak as the BD80U seems to opt for the inky blacks in areas where more detail is needed. Call it over saturation. The OPC feature substantially helps this issue but may cause other video noise to be introduced. Color Rendition/Color Accuracy: With most content colors appear pleasantly rich. With some content they fall into the washed out, or over saturated category. Again so much depends on the control features and processing. 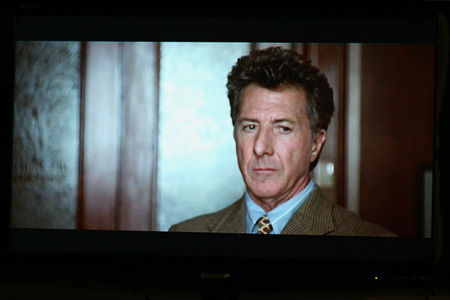 Another shot from Runaway Jury shows a nice skin tone presentation. However, the presentation varies by scene. In this scene skin tone seems washed out. Viewing Angle/Off Axis Viewing: Black appearance begins to take on a purplish hue at around 45% on the BD80U. The viewing angle is actually quite good all the way to 80 degrees (from the side) but with the noted contrast and black distortion. Motion Lag: There was notable jerkiness in scenes with side to side movement. The effects were reduced with the 120hz Fine Motion Enhanced feature turned on. False Contouring/ Mapping: Our HQV testing did expose some moire' pattern in the stadium seating test, though we did not see much false contouring in our video test material. Features: Obviously the key innovative feature of the Sharp LC-46BD80U is the built in Blu Ray DVD player. We found the inbuilt Blu Ray player to perform solidly and though we're not fond of the remote layout, there is sufficient control over the Blu Ray player. Functionally, the Blu Ray worked as well or better than a couple of outboard Blu Ray players we've used with the fast forward and reverse, skip chapter features, pause, and menu features all working quickly and with ease. The only drawback was torpid disc loading, which is common for Blu Ray's. All this was a very nice surprise since it is the reason to purchase this TV rather than the E77U series which has the same features without the Blu Ray. As mentioned above this TV has 120hz frame rate conversion called Fine Motion Enhanced which did not add a lot of unnecessary background information as many we've tested.. It has Sharp's anti glare screen. There is an OPC setting in the picture menu if the user wants automatic adjustment of the backlighting for varying room light conditions and content. This feature may be useful for brightly lit rooms. The 46BD80U's features are well thought out and effective. Aesthetic Considerations: The thin gloss bezel frame is shapely and attractive with thin 1.5" beveled edges on the sides and top. There is a dark blue accented bottom (nearly unnoticeable – it looks black in the room). The included table top stand is also attractive and conveniently swivels side to side. Depth is somewhat inhibiting at 5.4" which is of no small concern if wall mounting this TV – and we imagine that to be one of the primary reasons to purchase it. 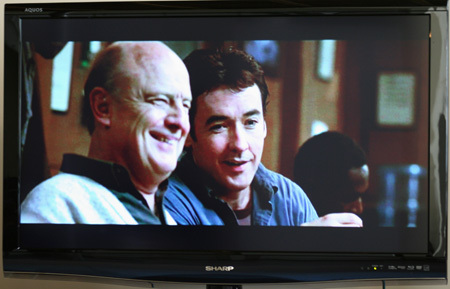 A wall right fitted wall mount could conceivably add no depth to the TV mounting due to the rear right mounted blu ray player taking up the last 1.5" inches of the total depth. The Sharp optional wall mount is the AN-52AG4. Check this option or a Peerless mount to see how much depth the mount will add. If the normal 1.5" to 2" is added from the wall mount, the screen could protrude 7" off the wall which is awkward in our opinion. Audio Output: There is great volume and upper range output on this TV. Sharp has one of the best audio presentations in the business. The 10W X 10W speakers will surprise you. We could hear clearly at 30% output and the voice clarity is top notch. 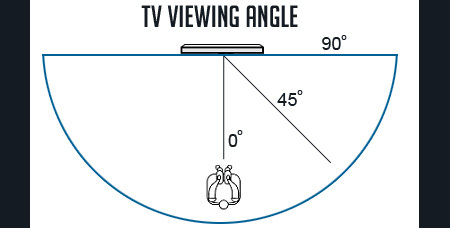 Video Aspect Ratio Sizing: 4:3 Zoom, Stretch, and Dot by Dot round out the effective options. Inputs: Very sufficient with PC 15 pin D-sub, 4 HDMI, USB port, 2 Component. Remote Control/Menu Functionality: The remote control has a small Blu Ray function box for the DVD Pop up and title list. Overall, the remote buttons are much too small. The menu button is a little dot. Despite using the remote control frequently, I could not become comfortable with locating important keys. The menu system is small, cryptic and difficult to see from a distance, though it is easy to navigate and with plenty of features. The user will need to access the Advanced Control Tab at the bottom of the Picture Menu to access many of the features noted above in the HD Picture Quality Section. The Menu System appears in the top left quadrant of the screen and is difficult to see from a distance. 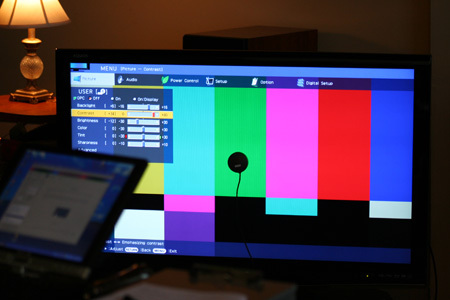 This shot calibrating color on the TV with our Sencore color pro system. Since the LC46BD80U has a built in Blu Ray player it is difficult to compare with other models. At $1400 it seems reasonably priced. It will, after all, save a couple hundred dollars on a Blu Ray player. The Samsung LN46B750 has Internet access (but not movie access) and 120Hz and sells for a good bit more at $1700. The LG 47LH50 has 120Hz processing and Internet connectivity which includes Netflix Instant Streaming making it a tough competitor to the BD80U. It sells for a more modest $1250. Lastly, the Sony KDL-46V5100 has 120Hz and Amazon Movies on Demand Internet connectivity. It sells for $1300. Review Equipment Used: Sony Blu Ray BDP-S1, Sony DVP-S50 DVD player, Sony Playstation 3 60GB Console, Sencore Color Pro 5000, Sencore Auto Cal Pro, Sencore signal generator.